In the Roman Rite, this week is the Octave of Easter, an ancient prolongation of the Easter feast over an entire week. The antiquity of the Easter Octave is evident in the assignment of Roman stational churches to each day. The Octave's traditional importance is evident in the status of the particular churches chosen as the stations each of the these days: Saint Mary Major (Easter Sunday), Saint Peter's (Monday) Saint Paul's Outside the Walls (Tuesday), Saint Lawrence Outside the Walls (Wednesday), The 12 Apostles (Thursday), Saint Mary ad Martyres ("The Pantheon," Friday), Saint John Lateran (Saturday), and Saint Pancras (Sunday). Of course, in the aftermath of the liturgical demolition of the 1960s, the stational churches are no longer mentioned in the Missal, and the order of the scripture readings during the octave has been unaccountably altered with the result that their original connections with the stations have largely been lost. But at least the Octave of Easter has survived, which is more than can be said for the now suppressed "Privileged" Octaves of Epiphany, Ascension, Pentecost, Corpus Christi, and Sacred Heart, the now suppressed "Common" Octaves of the Immaculate Conception, Saint Joseph, Saint John the Baptist, Saints Peter and Paul, the Assumption, and All Saints, and the now suppressed "Simple" Octaves of Saint Stephen, Saint John the Evangelist, the Holy Innocents, Saint Lawrence, and the Nativity of the BVM! On the other hand, the loss of the octaves of Epiphany, Ascension, and Pentecost, which - in practice even if not in theory - effectively downgraded the standing of those days, did, I believe, represent something of a loss to the Church's liturgy. There were some real improvements in the Easter season wrought by the 1969 Missal - most notably the more paschal Collects on both Sundays and weekdays. But those enhancements hardly necessitated the diminished importance of Ascension and Pentecost - both biblically based, ancient, and once widely popular festivals. Of course, it can be said that many people hardly notice such things. In today's world, in which the secular and liturgical calendars have been divorced, it may well be that whether a day is Pentecost Monday or the feast of Saint Paphnutius or a mere feria, whether the color is red or white or green, hardly impinges on most people's experience at all. But that is at best an argument for indifference to the liturgical tradition - not an argument for changing it. It can hardly be claimed that the absence of octaves has made the alternative celebrations any more resonant! Whether it is seriously possible to make Epiphany, Ascension, and Pentecost really resonate once again in today's secular consumerist culture is certainly a fair question. And how to do so is an even more challenging question. But one first step would be a calendar that more obviously suggests that such days - and the mysteries they celebrate - really do matter a lot more than the secular world is disposed to notice. Last night, I mentioned how, as far back as I can remember, the ringing of the bells at the Gloria has been one of my favorite Easter memories – a moment of sheer joy to be remembered throughout the year, and beyond! Having heard again the ancient story of how God saved his People Israel in the past - its full meaning now unlocked for us by Jesus’ triumph over death - the Church simply cannot contain her joy. And no wonder! For what bigger news has there ever been? What better news has there ever been? There is a famous scene in literature when the hopeless, despairing Faust (the scholar who sadly sold his soul to the Devil) was about to drink poison, with which he planned to end his pointless life, when suddenly he heard the sound of the church bells ringing, announcing Easter. Though Faust’s faith was weak and his hope all but gone, even so just the sound of the Easter bells brought him back from the brink of death, for, wonted to this strain from infancy, Faust says, back now to life again it calls me. Like Faust, we too have all heard the Easter bells, as year after year they continue to announce their glorious news. When I was growing up, back in the Bronx in the 1950s, the sound of the Easter bells set in motion an important annual ritual in our apartment. In those days, the Easter Vigil service was still celebrated in the early hours of Saturday morning, when hardly anyone was in church to hear the bells ring at the Gloria. But then, promptly at noon, when Lent ended and Easter officially began, churches all over the world let loose a cacophony of bells. At that moment, my grandmother would sit us all down at the kitchen table, where obedient to her command, we cracked open our Easter eggs, which we quickly consumed in eager anticipation of the next course – our Easter chocolate! Maybe, many of us here today may also be looking forward to some Easter chocolate – or maybe have had some already! But back to those bells! As I said, it is no wonder we ring bells at Easter! How else will the world hear this story? And hear it the world must - for everyone’s sake! That, after all, is what the Church is for – commissioned to preach to the people and testify (as Peter proclaimed in the reading we just heard from the Acts of the Apostles) that Jesus really is risen from the dead and that everyone who believes in him will receive forgiveness of sins through his name. Now the Church obviously isn’t just me and the deacon here, or the Bishop, or even the Pope. The Church is all of us. And there are a lot of us, and obviously we’re not all the same. In the Church, some of us run fast, like the disciple whom Jesus loved. Others, beset by doubts or daily difficulties, run much more slowly, like Peter in this morning’s Gospel. But what matters most, the story seems to suggest, is that we are here. Whether we are runners or walkers, we too have come like those first disciples to that tomb that was supposed to stay forever closed and dark, sealed from the world of the living by a stone, but from which that stone has now been removed, in order that we - and the world - may believe. In the normal course of events, the Sabbath day of rest should have been followed in the morning on the first day of the week by business as usual – both for the living, who would go back to their regular daily work, and even more so for the dead, decaying in their graves, who (then as now) were expected to stay dead. John’s Gospel says that Mary Magdalene came to the tomb early in the morning while it was still dark. The other Gospel writers tell us that Mary was accompanied by other women as well, and that their purpose in visiting the tomb was to honor Jesus’ body with spices. However many they were and whatever they expected to do, it was a dead man whose tomb they came to visit. But, instead of a corpse, they found something surprising and unexpected. For this morning, this 1st day of the week, this super-Sunday, the world awakens not to business as usual, but to something totally new – to, of all the things that God has ever done, the greatest of them all. And so we say today: This is the day the Lord has made! Let us rejoice and be glad! Easter invites us to put ourselves in the position of Mary Magdalene and Peter and all those other disciples unexpectedly experiencing something surprisingly new in a world where everything else seems so ordinary and old. Even so, as we just heard, the first few to be made aware of this momentous news left the empty tomb more confused than elated: For they did not yet understand the Scripture that he had to rise from the dead. Jesus’ resurrection was the most important event in all of human history. And yet, however hard it may be for us to imagine (in this multi-media age of the 24-hour news cycle), the world hardly noticed the resurrection at first. This year’s movie Risen, which some of you may have seen, offers some really interesting insights into the story, through its clever technique of looking at it through the experience of a Roman Tribune detailed to discover what really happened to Jesus’ missing body. It makes for a good story, but in reality the Romans probably didn’t even notice. Not yet anyway! Much later, they would, if course. Eastern Orthodox Christians even have a lovely legend in which Mary Magdalen made it all the way to Rome to tell Tiberius Caesar in person. When the Emperor replied that there was as much chance of Jesus having risen from the dead as there was for the egg on his table to turn red, the egg promptly did so, which is why Eastern Orthodox Christians exchange red-colored eggs on Easter. But, before any of that could happen, in a world which seemed permanently stuck in the dark, pre-dawn position, where death always seemed to have the final say, the disciples first needed to experience the kind of change that could come only from the Risen Lord’s living presence among them. And so do we, which is why we are here, where the Risen Lord brings us together as no one else can. And that is why we have to keep coming back, Sunday after Sunday, to be filled in on what happened next and thus experience the effects of the resurrection in ourselves. That is why every day for the next seven weeks, the Church retells the story of the first Christian communities in the Acts of the Apostles - the story of those who first experienced the reality of the resurrection and its power to change the world, starting with changing them. And so, throughout these seven weeks, the Easter Candle, the symbol of the Risen Christ and visible reminder of his great victory, will stand in its place of honor in the sanctuary, literally lighting our way through the Easter season as the Risen Lord lights our way through death to life. And further to hammer home that point, prominently displayed at a side altar is a classic icon of the Resurrection. This famous image portrays the Risen Christ standing over the broken gates of hell, lifting up from their coffins the common ancestors of the human race, Adam and Eve, – while, on one side, Moses, Isaiah, and Elijah, and, on the other, the Old Testament kings and John the Baptist look on. Again, like the two disciples in the Gospel, in the Church some of us run fast. Others obviously run much more slowly. But what matters most is where we finally end up. That power was soon evident in the enthusiastic response of Jews and pagans alike to the amazing story the apostles told. Over time, its effects have been equally dramatic in how the story has spread and the Church has grown as a result, in the dynamism that is at the heart of the Church’s existence in the world and that has propelled it outward in almost 2000 years of world-transforming activity. The resurrection is God’s powerful alternative to business as usual. None of us were there that first Easter – and, had we been, we would surely have been as amazed and uncomprehending as the disciples themselves. But without yet understanding it, the world awoke on Easter to something totally new. Thanks to the fact that Christ has risen from the dead, the Christian faith offers a real alternative to business as usual, offering instead to the entire world - and to each and every one of us in it - an invitation to hope. It is the power of that faith and hope that has brought us, whether this Easter or a long time ago, to the water of baptism, and that brings us back Sunday after Sunday to hear the rest of the story and to experience the presence of the risen Christ in the breaking of the bread and his power in the new people he is transforming us into and the amazingly wonderful things that we can now do with one another and for the world as a result. Peter's prominence in the gospel stories of the events that followed Jesus’ resurrection highlights how what was happening there continues to happen in the everyday life of the Church, as the Risen Lord continues to reveal himself to his people through the experience that we share by baptism as members of the uniquely new community that is the Church, brought into life by the Risen Lord's gift of the Holy Spirit. So may the sound of those bells continue to ring on in us. May everything we do ring with Easter joy, so that the whole world can experience that something really new has happened - the new life we now share with Christ our Risen Lord. May those bells, that encouraged even Faust to live again, live on in us. May everything we do ring with Easter joy, so the world can experience that something really new has happened - the wonderful new life we share with Christ our Risen Lord. Homily for Easter Sunday, Immaculate Conception Church, Knoxville, TN, March 27, 2016. The Exsultet brings us back to the heart of the ancient Passover story, which we recall tonight with this Vigil, just as the Jewish People have for so many centuries celebrated the Passover night’s annual return each spring. In the Book of Exodus we are told: This was a night of vigil for the Lord, as he led them out of the land of Egypt; so on this same night all the Israelites must keep a vigil for the Lord throughout their generations [Exodus 12:42]. That they have done, and so must we on this our annual Christian Passover night. On this night, when once God led Israel from slavery and brought them safely through the waters of the Red Sea, we too tonight follow the pillar of fire, our own Easter Candle marked with 5 grains of incense to signify the holy and glorious wounds of Christ’s passion, to relive that night when Christ broke the prison-bars of death and rose victorious from the underworld. Both in its antiquity and in its solemnity, the Exsultet testifies to the specialness of this Passover night, when once God led our forefathers, Israel’s children, from slavery in Egypt and made them pass dry-shod through the Red Sea – fulfilled for all and forever in this night when Christ broke the prison-bars of death and rose victorious from the underworld. In the centuries-old ritual for the Passover seder, it is said that “in every generation” every person should view him or herself as having personally come out of Egypt. In other words, Passover isn’t just some historical anniversary. It is something that happens in the lives of God’s People here and now. And so it is for us on this Passover feast of the Church, this Easter night. For, as the same Exsultet tells us, this is the night that even now, throughout the world, sets Christian believers apart from worldly vices and from the gloom of sin, leading them to grace and joining them to his holy ones. In times past, the faithful of Rome assembled at nightfall at the Basilica of St. John in the Lateran, the Mother Church of both the City and the world, for an all-night vigil. Meanwhile, next-door in the Baptistery the Church’s newest members, solemnly renouncing Satan and all his works, passed through the saving waters of baptism - an experience meant to be every bit as transformative for them as passing through the Red Sea was for the Israelites. The Exsultet expresses how they undoubtedly would have experienced their emergence from that Baptistery in the dawning light of Easter morning: The night shall be as bright as day, dazzling is the night for me, and full of gladness. And so it must be for all of us - whether we are being baptized or confirmed tonight or were baptized and confirmed many decades ago. As at a Passover seder, so on this most holy Easter night, we must each of us personally experience coming out of Egypt. We must each of us personally experience Christ breaking the prison-bars of death and rising victorious from the underworld. And then, because of that, we must each of us personally solemnly renounce Satan and all his works. Then, indeed, this night shall be as bright as day, dazzling and full of gladness. And so, tonight, having heard again the ancient Passover story - its full meaning now unlocked for us by Jesus’ triumph over death - the Church simply cannot contain her joy. Sadly silent these past two days, the bells have now been rung again with all the clamor they can muster. As many of you know, the ringing of the bells has always been my favorite part of the Easter Vigil – in fact, the part I most look forward to each year, a moment of sheer joy to be remembered all year long, and beyond. I’ll talk more about the bells tomorrow morning. Tonight, however, I want to look back at the strange way we began this Vigil, walking in the dark behind the light of the Easter Candle. The Exsultet sings eloquently in praise of that Easter Candle - this pillar, which glowing fire ignites for God’s honor, a fire into many flames divided, yet never dimmed by sharing of its light, for its fed by melting wax drawn out by mother bees to build a torch so precious. … Therefore, O Lord, we pray you that this candle, hallowed to the honor of your name, may persevere undimmed, to overcome the darkness of this night. Now a candle – however tall – is still just a candle. The night outside is still dark, despite all our efforts to the contrary. Life is like that. We go through life more or less in the dark, sometimes distracted by the scenery that surrounds us, sometimes stumbling dangerously, but hopefully staying on - or finding our way back - to the forward road. And we’re going to be better at staying on or finding our way back to that road if we all stick together, like our little procession tonight, following the way led by that single candle - relying on one another and supporting one another in the living community of the Church, this community created by that candle’s glowing fire ignited for the honor of God. Just as God once led his Chosen People through the threatening sea and the frightening desert by the light of a pillar of fire, so he continues today to lead his Church through the dangerous darkness of our world by the amazing brightness of the Risen Christ. So no wonder we ring those bells tonight. How else will the world hear this wonderful story? And hear it the world must, for everyone’s sake! Having huddled together in the dark and followed the light into this Church, our challenge now is to spread the news, with the assurance of the very first ones to hear the news. “Why do you seek the living among the dead,” the angels asked the terrified women that first Easter morning. The Gospel writers tell us that the women’s purpose in visiting the tomb was to honor Jesus’ body with spices. Whatever they were expecting, it was a dead man whose tomb they came to visit. But, instead of a corpse, they found something surprising and unexpected. The women, we are told, returned from the tomb and announced all these things to the eleven and to all the others. And, as they did then, so now must we! Homily for the Easter Vigil, Immaculate Conception Church, Knoxville, TN, March 26, 2016. "Of the Angel's Ave and Consummatum est"
Death and conception in mankind is one." From Upon the Annunciation and Passion Falling upon One Day 1608 by John Donne. It happened as recently as 2005, but won't again until 2157 - this occurrence of Good Friday on the feast of the Annunciation. In much patristic and medieval tradition, at least since the 3rd century, March 25 - the date of the vernal equinox in the Julian calendar - was thought to be both the anniversary of the Annunciation (and therefore of conception of Christ, the Incarnation of the Son of God as Son of Mary) and of the Crucifixion. to quote A Clerk of Oxford, "traditionally the conjunction of the two dates was considered to be both deliberate and profoundly meaningful. The date of the feast of the Annunciation was chosen to match the supposed historical date of the Crucifixion, as deduced from the Gospels, in order to underline the idea that Christ came into the world on the same day that he left it: his life formed a perfect circle. March 25 was both the first and the last day of his earthly life, the beginning and the completion of his work on earth. … This day was not only a conjunction of man-made calendars but also a meeting-place of solar, lunar, and natural cycles: both events were understood to have happened in the spring, when life returns to the earth, and at the vernal equinox, once the days begin to grow longer than the nights and light triumphs over the power of darkness." That represents the kind of spiritual and symbolic thinking that our ancient and medieval ancestors loved but which we spiritually and symbolically impoverished moderns increasingly find somewhat alien. Hence, horrible ideas like a fixed date of Easter have acquired a currency in our rationalistic, modern world which they would never have had for our ancient and medieval ancestors. As a medievalist, A Clerk of Oxford finds such a suggestion "rather depressing" - as should anyone who can at all appreciate spiritual and symbolic imagining! He sees in this a reminder of how the medieval Church "was in some ways immeasurably more humane and creative than its modern successors. It was happy to see human life as fully part of the natural world, shaped by the cycles of the sun and moon and the seasons; it was able to articulate a belief that material considerations, convenience, and economic productivity are not the highest goods, and not the only standards by which life should be lived. When confronted by calendar clashes with the potential to be a little awkward or inconvenient, the medieval church could have the imagination not to simply suppress them or tidy them away, but to find meaning in them - meaning which springs from deep knowledge of the images and poetry of scripture, the liturgy, and popular devotion." As many of you know, tomorrow will be my 68th birthday. But it was on a Holy Thursday night that I was actually born. I don’t believe being born on Holy Thursday predestined me to be a priest, but it may have increased my affection for this day, which has always been one of my favorites of the Church’s year. My earliest, childhood memory of Holy Thursday is a fleeting one. The Mass was still in the morning then. I remember the church being very crowded (as churches were in those days), and I remember the schoolgirls in their white communion dresses solemnly walking past in the procession at the end of Mass. I was seven years old when Pope Pius XII moved this Mass to evening. Once I was old enough to walk to church on my own at night, I became very fond of this Mass. I liked the very different way the church looked and felt at night. Of course, the Mass itself was very grand. The celebrant, deacon, and subdeacon all wore the finest gold vestments. The organ played and the Sanctus-Bell rang for the Gloria, then fell silent - replaced until Easter by a weird wooden clapper. Finally, came the part everyone was waiting for - the procession, still with lots of school-girls in their communion dresses, strewing flowers on the floor before the Blessed Sacrament. A lot has changed over the years. Still, a time traveler joining our congregation here tonight would readily recognize what day this is, and what we are remembering here tonight. Remembering is, of course what this night is all about. The church’s official liturgical books explicitly instruct us to remember “how the Lord Jesus, loving those who were his own in the world even to the end, offered his body and blood to the Father under the appearances of bread and wine, gave them to the apostles to eat and drink, then enjoined the apostles and their successors in the priesthood to offer them in turn” [Ceremonial of Bishops, 297]. These are the themes highlighted above all in Saint Paul’s 1st Letter to the Corinthians [1 Corinthians 11:23-26], which take us back in time to the most remembered meal in human history - Jesus’ Last Supper with his disciples on the day before the Passover. But what we remember is not just some interesting thing that Jesus and his disciples did a long time ago, but rather how that otherwise ordinary meal was dramatically transformed by Jesus’ own words and actions into the Church’s central sacrament – how Jesus’ Last Supper continues as a perpetual institution in the Church as the Lord’s Supper. For it is not back to Jesus’ Last supper, but to the Church’s Lord’s Supper that we return time and again. It is the Church’s Lord’s Supper, celebrating what God has done for us, that continues to make us who we are and transform us into who we hope to become. So the Church celebrates this sacrament daily, and she commands us to come together on the 1st day of each week to remember Jesus’ words and actions and to celebrate their continued, ongoing, transforming power to change us. Our life together as Christ’s Body, the Church, centered on the sacraments we celebrate here, is a great inheritance – an inheritance which we have received from the apostles, passed on to us through countless generations of people like us. Whether amid the splendor of a papal basilica or in the simplicity of a missionary outpost, whether with the Bishop in his cathedral or with friends and neighbors in our local parish church, this same Lord’s Supper has been celebrated generation after generation and treasured by every generation as its most precious inheritance – an inheritance which it is now our precious privilege to pass on to today’s world and to tomorrow’s generations to come. But, if Lord’s Supper is one of the Risen Christ’s great gifts to his Church, it is also a challenge. The four short verses we just heard from Paul’s 1st letter to the Corinthians are part of a longer text [1 Corinthians 11:20-32] (which used to be read in its entirety at this Mass), which highlights the Corinthians’ conflicts, dissensions, and factions – in other words, their resistance to being changed by the very Eucharist that they were privileged to experience together. We hear a lot in the news about the serious problem of inequality in our society, and we can certainly see and experience the consequences all around us. Well back then, among those to whom Saint Paul’s account of the Last Supper was originally addressed, all was not well either, even among themselves. It seems that the values of secular Roman society, with its social and class distinctions and inequalities, were making themselves felt even within the Church community, to the point that even the celebration of the Lord’s Supper seemed to mirror those distinctions and inequalities. Some have suggested that perhaps the rich got better food than others did at the community meal that in those days accompanied the Lord’s Supper, or that perhaps, since the rich had the leisure to arrive earlier, they ate first and left little or nothing for the others. Whatever exactly was going on, Paul’s point was that they were missing the meaning of the Lord’s Supper and the opportunity it offered for them to be transformed by it. So it is no accident that we dedicate church buildings and set them apart (even by their external appearance) from the secular world and its activities. For the Eucharist is not some meal just like any other, and the community it creates is not some social institution like any other. What happens here is meant to make us in an important way different from who we would otherwise have been, from the world we came here from and to which we must for the time being return. The Gospel account we just heard tells us that the Devil had already induced Judas to hand Jesus over. In the next scene that follows tonight’s account, after Judas had received a piece of bread from Jesus, Satan entered him, and Judas went out into the night. He left Jesus and the other disciples behind; he left behind the community that could have been his, in order to commit himself instead to Satan’s cause. What was the piece of bread that Jesus gave Judas? Was it the Eucharist? What a warning is there in that for us? So too for us tonight – and every time we come together to celebrate the Lord’s Supper - how we depart may matter much more than how we arrive. What kind of person have I become, and what kind of community have we become, because of what we have experienced and shared together in this very special place? What are we taking with us from this special place to remake ourselves and our world? What are we taking with us from this special place to proclaim to all the world – and for all the world - the death of the Lord until he comes? Homily for the Mass of the Lord’s Supper, Immaculate Conception Church, Knoxville, TN, Holy Thursday, March 24, 2016. Obviously I don’t believe that having been born on a Holy Thursday in any real way predestined me to be a priest, but it may perhaps have further increased my affection for this day, which has always been one of my favorites of the Church’s year. Before Pius XII's changes, the Holy Thursday Mass was, of course, still in the morning. I attended it at least once and can remember the church being very crowded (as churches were in those days). The only other thing that I remember was the schoolgirls in their white communion dresses solemnly walking past in the procession at the end of Mass. After the reform, which moved the Missa in Coena Domini to the evening, I was required to attend Holy Thursday Mass with the school in the morning. (New York had an indult to have a "Children's Mass" in the morning.) Once I was old enough to walk to church on my own at night, however, I became very fond of the Holy Thursday evening Mass. Undoubtedly that was part of my more-than-average liking for liturgical ceremonies and especially the more solemn ceremonies and a more-than-typical interest in the liturgical year. It was also the case that I really liked the very different way the church looked and felt at night. Of course, the Mass itself was very grand. The celebrant, deacon, and subdeacon all wore the finest gold vestments. The organ played and the Sanctus-Bell rang for the Gloria, then fell silent - replaced until Easter by a weird wooden clapper. Finally, came the part everyone was waiting for - the procession, still with lots of school-girls in their 1st-communion dresses, strewing flowers on the floor before the Blessed Sacrament. One of the 1955 reform's innovations was inserting the footwashing into the Mass, whereas previously it had been done afterwards - in those rare places where it was still done at all. (It survived, I believe, in the Spanish Royal Court where the King washed the feet of 12 men and the Queen the feet of 12 women right up until the 1931 revolution.) Since it was both a novelty and something so unlike any other liturgical ritual, the footwashing got a lot of attention. That would only increase with the subsequent changes. In due time, I would find myself celebrating Holy Thursday in churches where everyone's feet got washed, people pairing off to wash each other's feet in a seemingly endless ritual that overwhelmed the rest of the liturgy! Thankfully, such abuses are rarer now, but I have to acknowledge that in the 1980s and 1990s I too was swept up in the fashionable enthusiasm for the footwashing. So I can certainly understand and appreciate its appeal. Nowadays, however, I tend to favor a more low-key approach to it, which somewhat reduces its length and its tendency to distract from the principal focus of the celebration. As a priest, I love reciting the special Holy Thursday inserts in the Roman Canon. And I love carrying the Blessed Sacrament in the procession. To me, the procession remains the distinctive Holy Thursday thing, the element in the rite I most look forward to, even if the flower petals - and in many cases even torch-bearers - are now mainly memories from the past. Apart from the main Mass on Easter Sunday, Holy Thursday's Mass of the Lord's Supper is still my favorite of the four principal triduum liturgies. Holy Thursday appeals especially to priests, of course. Most people, I suppose, will always be content to confine their Triduum attendance to Easter Sunday morning. And that's fine. Like the disciples in the Easter Sunday Gospel, some of us rush eagerly and some of us don't. The important thing is that we all get where we need to be. While much has changed since I first experienced Holy Thursday in the 1950s, it is safe to say that a time-traveler would still be able to recognize the occasion and enter into the spirit of its celebration. And, for me, that spirit still seems to be just the right way to enter into the annual awesomeness of the Easter Triduum. On Palm Sunday, according to the Ceremonial of Bishops, "the Church enters upon the mystery of its crucified, buried, and risen Lord, who, by his entrance into Jerusalem, gave a glimpse of his own majesty. Christians carry branches as a sign of the royal triumph that Christ won by his acceptance of the cross." And then we take the blessed palms home and keep them there for the rest of the year as a further witness to our faith and trust in Christ the King's victory. Until Pius XII's 1950s reform of Holy Week, the old missa sicca, during which the palms were blessed prior to the actual Palm Sunday Mass, contained among its many wonderfully evocative prayers, this one which highlighted the significance of our retention of the blessed palms throughout the coming year: O God, who gather what is dispersed and preserve what is gathered, who blessed the people bearing branches and going out to meet Jesus, bless these branches of palm and of olive which your servants faithfully take up in honor of your name, that into whatever place these branches be brought, the dwellers therein may obtain your blessing, and, every adversity being driven from there, your right hand may protect those whom Jesus Christ, your Son, our Lord, redeemed. That prayer's apotropaic appreciation of the palms as permanent sacramentals survived somewhat in the newly invented prayer that concluded the Palm Sunday Procession from 1956 on, but then disappeared completely in the liturgical demolition of the late 1960s. So perhaps we need to say out loud in other ways what the liturgy no longer so loudly prays, and thus encourage ourselves to make fuller use of this annual sacramental by receiving blessed palms at church and then taking them home and keeping them there throughout the year. Once upon a time, Supreme Court nominations and confirmations were routine matters. By that, I don't mean that they weren't taken seriously by either the President or the Senate, but rather that when a vacancy occurred it was filled as the constitution prescribed. That the current Supreme Court vacancy has become just one more casualty of our polarized politics and dysfunctional election campaign is, in this instance, first of all a consequence of Republican obstructionism. But more deeply it highlights the absurdly outsized role the Supreme Court has come to play in American life. Otherwise why would it matter so much which party gets to choose the next Justice? When an institution can - and regularly does - do as much damage as the Supreme Court has done over the course of our history, then, of course, Court appointments are going to become politicized. The damage done by the Supreme Court over the years has been incalculable. This is the institution that has given us Dredd Scott v. Sandford, Plessy v. Fergusson, Lochner v. New York (and the whole pro-business "Lochner era" which that decision gave birth to), Buck v. Bell, Korematsu v. United States, Griswold v. Connecticut, Roe v. Wade, Bush v. Gore, Heller v. District of Columbia, and Citizens United v. Federal Election Commission. Obviously, one can also find Supreme Court decisions one agrees with and which have been of genuine benefit to the country. That's not the point, The point rather is the Court's unaccountability for its "interpretation" of the constitution. That is what makes its membership a political issue and why every four years or so we hear from one or both sides that the important issue in the election is which party will get to pick the next Supreme Court Justice, which may be true enough but represents a terrible distortion of emphasis given the many properly political issues facing the electorate. The Founders undoubtedly did not intend the Supreme Court to wield so much unaccountable power. So they confined the Court's accountability to the appointment process. That process is much more democratic now than the Founders had ever intended. So the democratic check, such as it is, on the Supreme Court is that its Justices are chosen by the President, who is himself now chosen in the closest thing we have to a popular national election, then confirmed by the Senate after a public process of hearings and debate. While a presidential election, under our constitutional system, is not a straightforward national plebiscite, it is the closest we ever come to one and over time has acquired the symbolic resonance of one. Hence the importance of respecting and following the president's constitutional mandate in regard to filling Supreme Court vacancies.That mandate - let Senators be reminded - was given by the American people to President Obama in 2008 and overwhelmingly renewed in 2012, and doesn't expire until noon on January 20, 2017. "A scrambled egg" is what one TV commentator (I didn't catch his name) called the current presidential campaign, even before the results were in from yesterday's decisive primary elections. Today, surveying the results, the situation seems both more and less scrambled. It is somewhat less scrambled for the Democrats, where what was always supposed to happen finally is happening. The Sanders campaign has indeed done a good job of scrambling the egg, forcing the Clinton campaign to address more seriously the persistently depressed state of what was once the core constituency of the Democratic Party, the once great American working class that has been increasingly abandoned by the party ever since the McGovern campaign did effectively abandon them in 1972. That said, the greater threat obviously to the working class (or any class other than the top tier) remains on the other side. So reality is setting in, and Democratic voters yesterday largely put aside sixties' style expressive politics in favor of a resounding vote to unite to defeat the Republicans. On the Republican side, the scrambling is structural. Donald Trump's populist overturning of the Republican establishment continues. Nothing dramatized that more than Marco Rubio's overdue departure from the scene. Rubio was the darling of both the neo-conservative intellectuals and the tea party. He was widely seen as the Republican party's great hope. His commitment to the Republican Establishment's agenda to make the rich even richer at the expense of everyone else was solid. But, even with good looks and a winning smile, his trustworthy republicanism was no match for the party outsider who tells it like it is to the long taken-for-granted Republican proletariat. John Kassich's victory in Ohio (his home state, where he is the popular sitting governor) keeps the situation scrambled in a more traditional way. In the old days, he could go to the convention as a "favorite son," keeping his state's delegation available to throw its support to a compromise candidate (conceivably himself). That scenario is still possible, of course, but so much less likely the way contemporary conventions function. Not that long ago, a "favorite son" emerging from a convention as a compromise candidate would have been a credible scenario. In today's political universe, it is hard to see how someone with no significant base of support beyond his home state can credibly claim the allegiance of the party as a whole. It would be hard enough for the "Establishment" to put together enough votes to deny Trump the nomination at the convention. It would be even harder for a candidate nominated under such circumstances to win the allegiance of Trump's disappointed supporters whose loyalty is less to the party than to the outsider who is blowing the party apart. Surprise: It is not good to be alone! The conclusion the article draws from Twenge's research "is that while there’s no way to go back to family farms and young marriage and parenthood — and, from an equality standpoint, we wouldn’t want to anyway — modern life needs to do a better job of connecting people to one another, and encouraging them to adopt the sorts of goals and outlooks that will make them happy." An old Italian aphorism warns that, without paesani, one will not find happiness in life. Is it really at all surprising that what Genesis 2 and most of human cultural history have taught -that we are not meant to live primarily autonomous individualized lives - is again being confirmed by the pathologies evident in this first era in human history to try to construct and organize human life on a contrary principle? "The story of Obama's encounter with the Middle East follows an arc of disenchantment." So writes Jeffrey Goldberg in a lengthy article in the April 2016 issue of The Atlantic, "The Obama Doctrine: The U.S. President talks through his hardest decisions about America's role in the world." It's a long article (72 pages), but well worth the effort to read - and not just as an alternative to the popular sloganeering that dominates this presidential campaign and that substitutes for reasoned discourse about foreign policy so much of the time. Goldberg is a serious analyst. And his subject, the President, is a sophisticated and nuanced thinker about foreign policy, whose evolving reasoning about foreign affairs in general and the Middle East in particular Goldberg illuminates with appreciative clarity. Goldberg starts from the President's fateful decision in the late summer of 2013 not to follow through on the threat implied in the President's previous rhetoric about a "red line" which Syria dare not cross, but which Asad then did cross. For some, Obama's inaction "brought to a premature end America's reign as the world's sole indispensable superpower." For others, the President had "peered into the Middle Eastern abyss and stepped back from the consuming void." It is, of course, in the very nature of such issues that we won't really know for some time which interpretation is right, or whether both are right in part and wrong in part. Personally, I think it is hard to escape the conclusion that those who opposed attacking Syria to enforce that infamous "red line" (the UK House of Commons and the US Congress, among many others) must bear some share of responsibility for the continuance and escalation of the conflict and the terrible refugee crisis that conflict has created. (For that matter, so must those who enthusiastically cheered on the so-called "Arab Spring," which inexorably helped set this whole process in motion.) On the other hand, we can have little confidence that military intervention in 2013 would necessarily have accomplished its intended purpose, or that it would not - like Iraq in 2003 and Libya in 2011 - have unintentionally produced a possibly even worse outcome. Hence the continued plausibility of both interpretations of Obama's action. The particular merit of Goldberg's article - based on multiple interviews with the President - is to illuminate how his thinking has evolved with the events and how it has helped him break free from what Goldberg calls "the foreign-policy establishment and its cruise-missile playbook, but also the demands of America's frustrating, high-maintenance allies in the Middle East" (e.g., Saudi Arabia) - and "to distinguish the merely urgent from the truly important, and to focus on the important." For me what was particularly revealing is how the president has come to combine a strong conviction that U.S. leadership is essential in international affairs - "if we don't set the agenda, it doesn't happen" - with a realistic recognition - Goldberg calls it "fatalistic" - of the limitations of American power given the larger forces (e.g., "tribalism") that constrain American ability abroad. In light of the current campaign discourse, it is also noteworthy how, on the one hand, Obama is sensitive to and perturbed by the perennial problem of allies who are essentially "free riders" not taking sufficient responsibility, while, on the other hand, he still views multilateralism as essential, in part because of his belief "that sharing leadership with other countries is a way to check America's more unruly impulses." Goldberg also unpacks Obama's growing perspective (which I am increasingly convinced is correct) that the Israeli-Palestinian conflict is no longer so central to the Middle East and that the Middle East itself is less central to American interests. (And, even if it were more important, there is little the US can really do to solve its sectarian dysfunctions.) I think Obama's diagnosis is fundamentally on target that our "desire to fix the sorts of problems that manifest themselves most drastically in the Middle East inevitably leads to warfare, to the deaths of U.S. soldiers, and to the eventual hemorrhaging of U.S. credibility and power." As for whether his preoccupation with Asia is, in fact, the essential engagement with the future that Obama apparently believes it is, regarding that too time will tell. The challenge for the next President and her/his foreign policy team will be to remain not just the sole superpower but the indispensable party to any progress on almost any front on almost any issue, while at the same time recalibrating the reigning foreign policy playbook in ways which more realistically recognize the difference between "the merely urgent" and "the truly important." Part of that will almost certainly include a diminished preoccupation with the Middle East and its irresolvable conflicts. 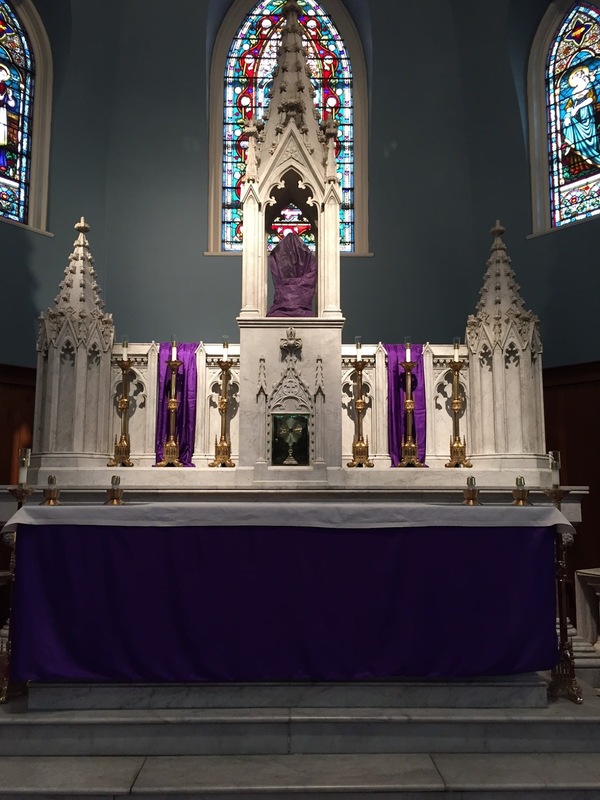 The altar crucifixes, the statues, and other sacred images are all covered in purple today. Until relatively recently, this 5th Sunday of Lent was called “Passion Sunday.” With just two weeks to go till Easter, today marks the beginning of Lent’s final phase, as the Church focuses our attention more and more on the final events of Jesus’ earthly life – and why those events matter for us today. The gospel we just heard [John 11:1-45] recounts the last miracle of Jesus’ public life – miracles which John’s Gospel calls “signs” because they function to reveal Jesus and invite us to respond to him with faith. The raising of Lazarus is the last and greatest of these “signs.” But it also led the authorities to seek Jesus’ death. So life and death are mixed together, as the same event that suggests the new life Jesus makes possible for us also results (on the part of his enemies) in a decision for death. The apostle Thomas’s somewhat surprising exclamation, “Let us also go to die with him,” is actually addressed to us, as the Church invites us to accompany Jesus in his final journey. In Rome, the Lenten stational liturgy is celebrated today with special solemnity at Saint Peter’s Basilica. Many of the Basilica’s relics are exposed for veneration on the main altar above Peter’s tomb, and at Vespers there is a procession and special veneration of an image of Christ believed by some to be Veronica’s veil. On top of all that, today we celebrate the 3rd (and final) Scrutiny of the elect, preparing for baptism just two weeks from now at Easter. According to the rubrics, the Scrutinies should deepen the elect’s resolve to hold fast to Christ and to love God above all. How’s that for a modest goal? It would, of course, be absurdly ambitious if we relied entirely on ourselves. But it is Christ who is at work in us, Christ who (as we just heard) will give life to our mortal bodies through his Spirit dwelling in us [Romans 8:11]. All of which brings us back to the amazing story of Jesus and Lazarus. The friendship shared by Jesus and Lazarus extended also to his sisters, Martha and Mary, who first sent him the news of their brother’s serious sickness. Strangely, however, he initially seemed to ignore their message, letting Lazarus die and be buried, thus setting the stage for his greatest miracle, but before that for an important conversation with Martha, which for so many centuries has been the standard gospel reading at Catholic funerals. As he did in his earlier conversations with the Samaritan woman and the man born blind, Jesus uses the conversation to reveal something important about himself. Jesus’ surprising answer to Martha, I am the resurrection and the life, was intended to hint ahead to his own unique experience of resurrection – something neither Martha nor anyone else would have understood at the time, since no one was then expecting the Messiah (or, for that matter anyone else) to rise from the dead, all by himself, ahead of everyone else. We, however, can follow the story backwards, so to speak. We start from the fundamental fact that Jesus has risen from the dead, and then we understand his death - and his whole life - in the light of that. Lazarus was brought back from the tomb to resume his ordinary life (and then to die again eventually). Unlike Lazarus, however, Jesus would rise out of his tomb in order to live forever. Bystanders had to take away the stone for Lazarus to be able to come out, and Lazarus himself emerged bound hand and foot. In Jesus’ case, however, no one would either have to help him to come out or have to untie him. The resurrected life of the Risen Christ is something altogether new and different and means death’s decisive defeat. The raising of Lazarus looks ahead to the resurrection of Jesus, which will finally fulfill God’s promise to Ezekiel, which we heard earlier [Ezekiel 37:12-14]: I will open your graves and have you rise from them. I will put my spirit in you that you may live. I have promised, and I will do it, says the Lord. Martha’s invitation to Mary, The teacher is here and is asking for you, is addressed to all of us, who are in turn invited to address it to one another - and to this world which so desperately needs to hear it, but which sometimes seems so lacking in hope. After experiencing what Jesus had done for Lazarus, many believed in him, but others went to report him to his enemies. Jesus’ own resurrection, to which the experience of Lazarus looks forward, likewise challenges each of us to respond - one way or the other. 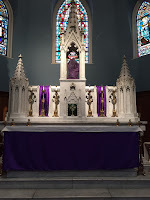 Homily at the 3rd Scrutiny of the Elect and the Presentation of the Lord's Prayer, Immaculate Conception Church, Knoxville, TN, the 5th Sunday of Lent, March 13, 2016. Super Tuesday - Now What?